How Do I Run the Uplay PC Client in Offline Mode? How do I launch the Uplay PC client in Offline Mode? When running the Uplay PC client while being connected to the Internet, you can benefit from all the functionalities and services it offers - such as the friends system, Actions & Rewards, latest news and more - and, of course, enjoy the online features of your games. However, you are not required to be online at all times to access your games. When in offline mode, most features will be unavailable, but you can start your game from the Games tab as usual. Almost all games in our current catalogue can be played offline after they have been activated, providing they do not have any always online dependencies, and your solo campaign will resume from the latest local save. 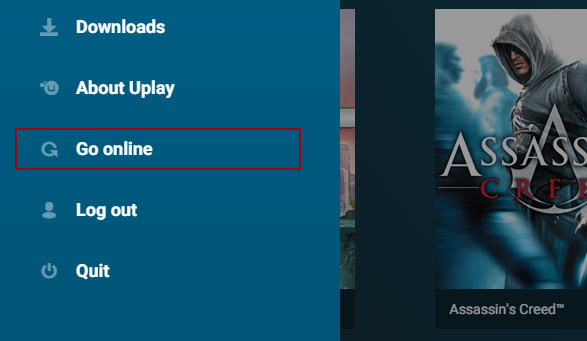 Once in Offline mode you can switch back to Online mode at any time by clicking Go online in the Uplay client menu. Error message: "There was a problem authenticating the ownership of this product"
What should I do if I receive the error message "There was a problem authenticating the ownership of this product"?